On Saturday, January 20th, Eastern American Diocesan Bishop Nicholas of Manhattan, visited Holy Epiphany Church in Boston, MA, where he led the divine services. His Grace’s visit was timed for the parish festivities in honor of its patronal feast, which had taken place on Friday, January 19. 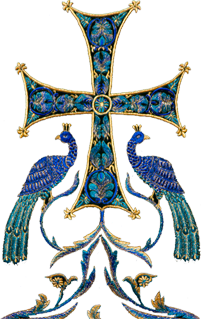 On Thursday the 18th and Friday the 19th of January, the great feast of the Baptism of the Lord – Theophany, Eastern American Diocesan vicar Bishop Nicholas of Manhattan led the festal divine services in the Synodal Cathedral of the Sign in New York City. 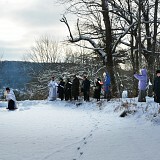 The Diocesan Media Office has begun publishing photo-reports of the feast of the Baptism of our Lord (Theophany) in parishes and monasteries of the Eastern American Diocese on the diocesan website. Online registration for the 2018 Lenten Retreat for clergy of the Eastern American Diocese has opened on the diocesan website. 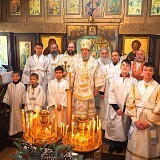 On Monday, January 15, the feast of the Repose and Second Finding of the Relics of Venerable Seraphim, Wonderworker of Sarov, and the anniversary of his ordination to the priesthood, Protopresbyter Valery Lukianov celebrated Divine Liturgy in St. Alexander Nevsky Diocesan Cathedral in Howell, NJ. On Sunday the 14th and Monday the 15th of January, Holy Dormition Convent "Novo-Diveevo" in Nanuet, NY celebrated the patronal feast of the convent’s principal church – St. Seraphim Cathedral. 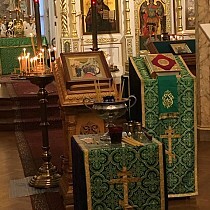 All-Night Vigil was served on the eve of the feast, while the traditional services were performed the day of: a moleben and akathist to Venerable Seraphim, Wonderworker of Sarov, the blessing of the water, and Divine Liturgy. On Saturday the 6th and Sunday the 7th of January, the clergy and faithful of St. Alexander Nevsky Diocesan Cathedral in Howell, NJ celebrated the great feast of the Nativity according to the flesh of our Lord Jesus Christ. In preparation for the feast, the cathedral was beautifully decorated with trees, wreathes, garlands, ribbons, bows, and lights. On Saturday the 6th and Sunday the 7th of January, the great feast of the Nativity of our Lord Jesus Christ, His Grace, Bishop Jerome, led the divine services in Nativity of the Mother of God Church at the New Kursk Root Hermitage in Mahopac, NY. On Saturday the 6th and Sunday the 7th of January, the parishioners of St. John the Baptist Cathedral in Mayfield, PA celebrated the great feast of the Nativity of Christ. On Monday the 8th and Tuesday the 9th of January, Bishop Nicholas of Manhattan paid an archpastoral visit to the monastery. On Monday, upon arrival at the holy habitation, His Grace served Vespers & Matins in the cathedral. During the Sixth Hour, Reader Nicholas Kotar was ordained a subdeacon, and later at the same service was ordained to the diaconate. 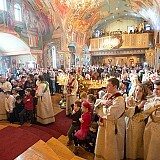 After the Great Entrance, Deacon Sergei Kosov was ordained a priest. 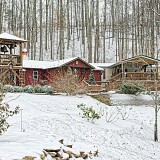 Both clerics will fulfill their service at Holy Trinity Monastery. 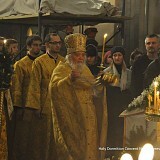 On Saturday the 6th and Sunday the 7th of January, Eastern American Diocesan vicar Bishop Nicholas of Manhattan led the divine services for the Nativity of Christ in the Synodal Cathedral of the Sign in New York City. 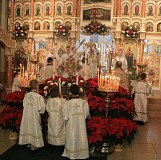 The All-Night Vigil for Nativity was served in a festal, joyous, and warm atmosphere. 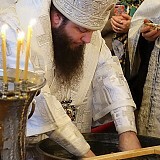 On Saturday, January 6, the Eve of Christ’s Nativity, Metropolitan Hilarion of Eastern America & New York, First Hierarch of the Russian Church Abroad, led the divine services in Sts. Peter & Paul Diocesan Cathedral of the Diocese of Australia & New Zealand. From the depths of my heart, I congratulate you on the great feast of the Nativity of Christ – the feast of the birth in the flesh of our Lord and Savior Jesus Christ from the Holy Spirit and the Most Pure Virgin Mary. Today we call upon all people, together with the Church, to glorify the Creator and Maker with the words: "O all the earth, sing ye unto the Lord" (Irmos of the First Ode of the Canon for the Nativity of Christ). It is with a feeling of the greatest joy that I express my heartfelt greetings on the Nativity of our Lord Jesus Christ and the approaching feast day of the Baptism of the Lord! As expressed in one of our church hymns celebrating this holy event, when God deemed it good to appear on Earth, the entire world hastened to bring Him gifts: "The Angels offer a hymn; the heavens, a star; the Magi, gifts; the shepherds, adoration; the earth, a cave; the wilderness, a manger." The past 2017 year marked the centennial of the terrible revolutionary events that led to the mass exodus of the Russian people from the territory of the former Russian Empire and their resettlement around the globe. To this day, as a result of the sorrowful events of 100 years past, the Orthodox Russian people are perhaps the most scattered in the world.